COLOR(S): Liver and white, solid liver, black and white in UK. The German Wirehaired Pointer is a powerful, study, well-muscled, well-balanced, medium sized dog. It has a coarse, wiry, weather-resistant coat, bushy eyebrows, mustache and beard. German Wirehaired Pointer puppies and dogs are responsive, gentle, affectionate, and even-tempered. They are very active and energetic; they do not do well in apartment, as they need extensive exercise. This breed is an all-around gun dog; they like hunting birds and small animals. German Wirehaired Pointer puppies and dogs make excellent watchdogs. German Wirehaired Pointer puppies and dogs thrive on human companionship; they are very affectionate, loyal, active and intelligent. They are steady, lively and vigorous. They are responsive, eager to learn and enjoy working for their owners. This breed is very affectionate with their owner and can become jealous. They are best with older, considerate children. They need consistent, experienced handlers. Socialization and obedience training at an early age is a must. The German Wirehaired Pointer is naturally aloof with strangers. They make an excellent watchdog. German Wirehaired Pointer puppies and dogs can be rather willful; they like to roam. This breed is a perfect gun dog; they are able to hunt any sort of game on any sort of terrain. This dog has a good nose and can track, point, and retrieve on both land and water. Usually German Wirehaired Pointer puppies and dogs get along well with other dogs and household pets, though some may try to dominate other animals. Thick and harsh, no longer than 1.5 inches with a dense undercoat. Brush the coat a couple of times a week. Thinning is necessary in the spring and fall. Bath German Wirehaired Pointer puppies and dogs when necessary. Regular attention to the ears is needed. This breed has been relatively healthy over the years. There have been cases of hip dysplasia and entropion. Sometimes hormone problems affect their coats. German Wirehaired Pointer puppies and dogs need a considerable amount of exercise, as they are an energetic hunter. 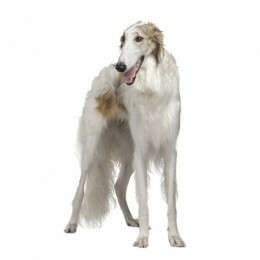 Vigorous rough-housing combined with daily walks or runs are good for this breed. Their coat should never have to be clipped. German Wirehaired Pointer puppies and dogs need to be taught basic obedience and socialized early to other dogs and humans. They do, however, enjoy learning and training. They require firm training.